All Chuggington diecast models now reduced, hurry while stocks last. 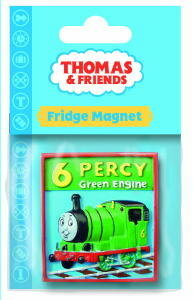 A Percy poly resin fridge magnet. Please note the purchasing of all products on this site is currently disabled, please check back soon when we reopen - hope to see you then! To recieve our enews with details of new products and special offers plus the chance to win a Thomas Hot Water Bottle worth £10.99 in this month's competition. Simply register here.